Given the abject failure of the Palestine Liberation Organization to secure Palestinian rights over the decades since it was established, it is long past time to explore how a national liberation strategy can be elaborated and by whom. 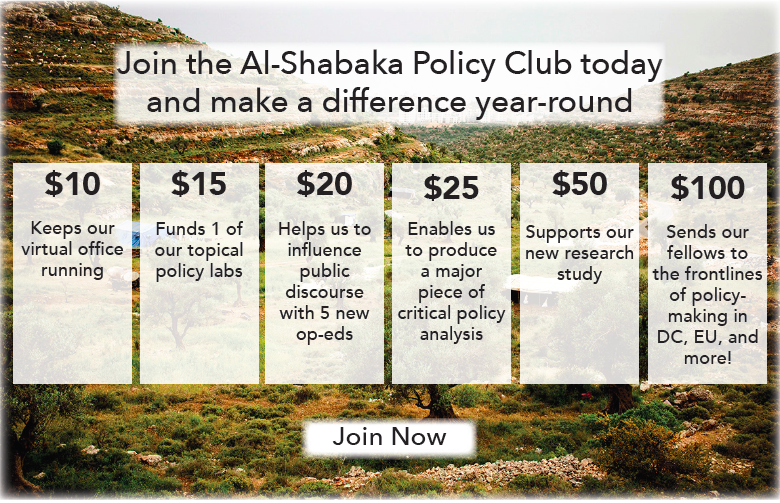 In this policy brief, Al-Shabaka Policy Advisor Noura Erakat examines the political leadership vacuum left by the Oslo Accords and then discusses the role of the Palestinian diaspora in the creation of numerous transnational networks that have attempted to fill the void of authoritative leadership. She then discusses the role of the Boycott National Committee and the strategy of using boycott, divestment, and sanctions as a human rights-based approach without a political program. Erakat also draws on lessons from the South African experience and addresses the dangers of achieving reconciliation without revolutionary solutions. The Palestinian leadership briefly returned to the weathered tables of diplomatic niceties to negotiate a path to negotiations. The return signaled an alarming regression from the confrontational stance the leadership made in September 2011, when it took its case to the United Nations. Then, notably buoyed by President Mahmoud Abbas’s liberation message to the global community, Palestinians thought it possible that the leadership would remove its self-determination struggle from the sterile confines of bilateral negotiations and place it on an international stage. In the event, the Palestine Liberation Organization (PLO) decision to resume negotiations for a while dashed any hope that the Palestinian leadership has a strategic vision for national liberation. During the 18 years of the ‘peace process’ the settler population has more than doubled, the Jordan Valley has been all but declared a closed military zone, the Annexation Wall has expropriated 12 percent of the West Bank, with 62 percent of the West Bank beyond Palestinian control, the Gaza Strip has been reduced to destitution under the heavy-handedness of war and an ongoing blockade, and the ethnic cleansing of Jerusalem has dramatically accelerated. In these circumstances, any return to negotiations, however brief, can neither be justified nor forgiven. Absent a Palestinian national liberation strategy, negotiations are counterproductive to Palestinian national interests. The Palestinian Authority’s (PA) electoral mandate of the West Bank’s 2.5 million Palestinians has long expired and, even were it in force, the PA “represents” only a quarter of the global Palestinian population. Thus, it may be fair to ask whether some other body can responsibly develop a national liberation strategy that will be more representative than what the PA/PLO has been able to offer for more than two decades, and if so, what its goals should be. The lack of a political program representing Palestinian national aspirations follows the steady erosion of the PLO in the aftermath of the Oslo Accords. In his unpublished paper, “The Rise and Fall of the PLO: A History of the Palestine Liberation Organization,” Seif Da'na writes, "The Oslo agreement prepared the grounds for the demise of the PLO, both as a structure and program, initiating a conflict inside the PLO between the bureaucrats interlinked with the new ruling class, and figures professing PLO ideals and liberation and independence. This inevitable rivalry intensified as the Palestinian Authority has gradually replaced the PLO as a political structure and the nature of the Palestinian question was significantly redefined." The tensions between the aims and structure of the PA with those of the PLO has sharpened with Hamas’s electoral victory in January 2006, and again, when the PA, under the auspices of the PLO, approached the United Nations in its bid for to become a member state. In immediate response to Hamas’s legislative victory, the US, Israel, and the European Union imposed sanctions on the PA, having already declared Hamas a “terrorist organization.” This exacerbated tensions between Fatah, the once-dominant secular political party led by late PLO Chairman Yasser Arafat, and the PA. Tensions reached their apex, when Hamas routed Fatah from Gaza in June 2007, in what can be described as a preemptive coup, which resulted in a politically and geographically bifurcated Palestinian government. 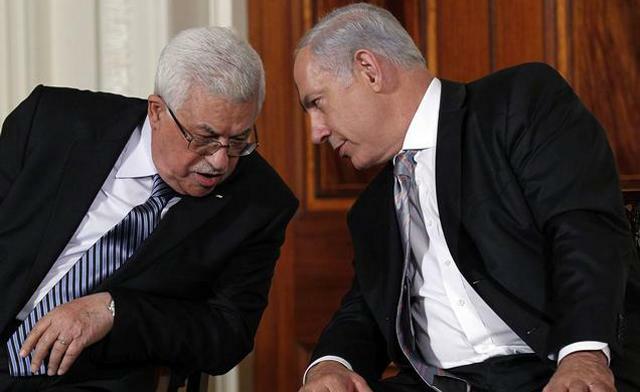 Thereafter, the US and Israel resumed their financial and diplomatic support of the Fatah-dominated PA thereby affording Fatah considerable influence over the official Palestinian political agenda. Palestinians asked this question again in the lead-up to September 2011, when the PA/PLO applied for membership in the UN. Since 1974, the PLO, which likes to remind the world that it is the “sole and legitimate representative of the Palestinian people”, has had observer status at the UN, when the UN General Assembly passed resolution 3236. The statehood bid raised concerns that if the UN granted Palestine membership, the PA, which only represents the Occupied Palestinian Territory (OPT), would supplant the PLO as the Palestinian representative body to the global community. Palestinians living in the Diaspora feared that they would be excluded from Palestinian national representation altogether. The threat of such exclusion prompted many Palestinians in the Diaspora to reject the statehood bid in unequivocal terms. In the wake of the 2005 Palestinian Civil Society Call for boycott, divestment, and sanctions (BDS), endorsed by over 170 civil society organizations, the BDS National Committee (BNC) emerged to lead the global movement that was coalescing against the need to respond with non-violent economic measures to Israel’s violations of international law. In addition to representatives of civil society organizations, the BNC now includes representation of Palestinian political forces in the form of the Coalition of National and Islamic Forces. By providing a central Palestinian reference point and authoritative guidance to global solidarity, the BNC has partially filled a void left by the disappearance of a once commanding PLO, even though it has no claims to do so. In addition, the 2005 BDS Call grounded Palestinian self-determination within the universal frame of international law and human rights norms, based on three demands: ending the occupation and colonization of all Arab lands, full equality for Israel’s Arab-Palestinian citizens, and the right of return of Palestinian refugees. It did not, however, offer a political vision or program. Omar Barghouti, a founding member of the BDS movement and the BNC, explains, “The BNC does not take sides in the one-state v. two-state solution debate among Palestinians.” Indeed, the three rights-based demands enshrined in the BDS call are necessary but not sufficient for the achievement of national self-determination. In addition, they do not correspond to a particular political program among Palestinians. The BNC presently comes the closest of all these organizations in the Diaspora to representing comprehensive national interests. However, it has steadfastly refused to fulfill a political mandate. Barghouti insists “[t]he BNC is not, and does not, aspire to become an alternative political body. The political leadership of the Palestinian people must remain within the structures of the PLO...” However, because the BNC only seeks to be an authoritative reference with regard to BDS, the tactic, and the lexicon that surrounds it, has often been mistaken for a national liberation strategy. The BNC position raises two primary challenges for the Palestinian body politic. First, because the BNC does not claim a representational mandate equivalent to that of the Palestinian Liberation Organization, this creates confusion among solidarity groups who can consequently adopt a call for human rights, but without being held accountable to a political program. Second, in the absence of a national liberation strategy, BDS’s major successes can only expand the call for rights; they cannot achieve Palestinian self-determination. Should Palestinians go so far as to support annexation of the OPT in order to usher in an era of struggle for equality within a singular territory and legal regime? Should settlements be racially integrated or completely demolished? Will the amendment of Israeli laws ensuring equality ever suffice to change its character from Jewish to secular? Should Palestinian citizens of Israel focus on an equality struggle or should they articulate a comprehensive frame to combat ethnic cleansing within Israel Proper as well as the OPT? What is the role of the PA, as an outcome of Oslo, if any? 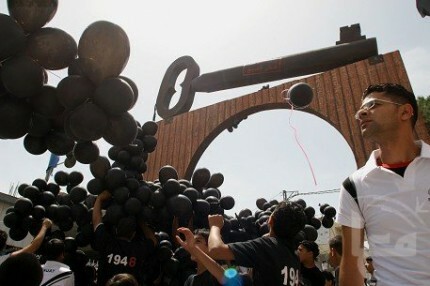 Should it be boycotted, dismantled, or leveraged as recently suggested by PLO Executive Committee member Hanan Ashrawi? What type of economy should Palestinians advocate for? With which states and international movements should Palestinians ally for economic, political, and security support? What is the role of armed resistance? If it is still salient, how does it relate to non-violent direct action? It is interesting to note that, in 2011, the PYM removed the language of a rights-based approach from its charter, because, according to a consensus among its members, it made them lose sight of the need for a direct grassroots mobilization among Palestinian communities. A similar approach inspired the Freedom Riders action, when a group of independent Palestinian activists defiantly boarded settler buses bound for East Jerusalem to demonstrate against the insidious nature of Israel’s institutionalized segregation of public and private spatial territories. The action drew international attention and praise for highlighting Israel’s apartheid system. It also drew controversy among Palestinians who mistakenly read it as a demand to end segregation amongst settlements and their exclusionary transportation systems rather than to liberate the lands upon which they sprawl. The controversy sparked a healthy discussion amongst Palestinians about the limitations of a human rights language. Both approaches speak to the tension between a rights-based approach and a political program clearly aimed at achieving self-determination and national liberation. Despite these internal Palestinian tensions, a rights-based approach remains a salient reference for international solidarity activists. Hannah Mermelstein, a leading member of Adalah-NY and a longtime human rights activist, notes “Not every Palestinian person on the street is necessarily active in BDS, but it is a platform that very few Palestinians would disagree with. It’s a bottom line, a set of rights, a framework, and to me that is just as important as the tactic itself.” Though the BNC’s rights-based approach may arguably represent a common denominator amongst Palestinians, the lack of a political program that it can advance structurally limits its ability to achieve self-determination. Does the experience of struggle against apartheid rule South Africa offer a way beyond the tensions between a human rights-based approach and a political program for national liberation? There are of course differences between the Palestinian and Apartheid South African cases. For example, the call to boycott Apartheid South Africa was made by African states in 1961 and adopted by the UN General Assembly adopted in 1962 (Resolution 1761.) By contrast, the 2005 BDS Call was made by a large coalition of Palestinian civil society associations and networks, was only partially endorsed by the Palestinian Authority, and has not been embraced by any Arab regimes, let alone by the UN General Assembly. And yet, despite its apparent cohesion, the South African boycott movement also suffered from internal divisiveness. Bill Fletcher Jr., scholar and past President of the TransAfrica Forum, notes that although the African National Congress (ANC) was the most widely known South African political party in the United States, other parties included the Pan-African Congress (PAC) and Azania People’s Movement (Azapo). Each party represented distinct movements influenced by international and domestic politics. As in the case of Palestine, international solidarity had many choices for an authoritative reference. Unlike the case of Palestine, however, Fletcher explains, “solidarity was very broad and there was never a need to pick sides, to choose which organization to ally with.” Instead, solidarity activists committed themselves to end Apartheid, although, as Flethcher notes, “no one was quite sure what the end of Apartheid would mean.” Despite lacking a shared political vision, solidarity activists agreed that victory would include Black majority rule, an end to segregation, land redistribution, and the release of all political prisoners. Barghouti points to similar struggles within the BDS movement against Israel where, “some soft Zionist groups have tried at various stages, sometimes desperately, to dilute the demands of the BDS call, limiting them to ending the 1967 occupation, and, in conjunction, to obscure the Palestinian reference of the global BDS movement, but their efforts were decisively aborted.” Although these “soft Zionist” attempts clearly have their own political agenda, they also highlight the problem of the absence of a political program, and the dependence on a rights-based approach. In this context, activists can, and are often encouraged to express their support for human rights irrespective of the political will of the people they claim to support. Of course today, people’s movements with armies are marginalized as terrorist organizations. In any case, the potential for revolutionary transformation will arguably have to emerge from a political, economic, social, and civic platform. The most pressing challenge at this juncture is to decide who will engender this platform, and how they will do it, and to define the scope of its geographic reach, and the salience of its political representation. To this end, the movement to revitalize the Palestinian National Council (PNC) may prove significant. Following Al Jazeera’s release of the infamous “Palestine Papers,” Palestinians from Lebanon, Britain, the US, the Occupied Territories, and within Israel demanded more accountable political leadership. The resuscitation of the PNC stood out among this decentralized movement’s demands. That demand has since crystallized into a global, coordinated movement to first register Palestinians by October 2012, and then to hold elections for the PNC. Even after registration is complete, and assuming that PNC elections are accepted as legitimate by an identifiable Palestinian national body, the “what next” question will continue to loom large. Joudah’s response appears closest to the South African model for revolutionary transformation: to work on all fronts while addressing the core question of a national liberation strategy and the leadership necessary for its achievement. The Palestinian political arena currently encompasses a non-representative political body that claims leadership in international circles (the PA/PLO), a powerful civil society movement that seeks Palestinian rights without claiming representation or a political program (the BNC), smaller but growing Diaspora groupings that do seek political representation (the USPCN and PYM), and a budding effort to seek national representation through universal elections to the PNC. In this context, the most effective strategy does seem to be to struggle for rights while working on a political program and engendering a representative leadership, especially at a time when an increasingly sympathetic world is gradually expanding its support for the Palestinians’ national aspirations. Noura Erakat is a Palestinian attorney and human rights advocate. She is currently an adjunct professor of international human rights law in the Middle East at Georgetown University. Most recently she served as Legal Counsel for a Congressional Subcommittee in the House of Representatives and as an advisor on Middle East affairs for Congressman Dennis Kucinich. Noura comments regularly on US foreign policy and international law matters. She has appeared on Al Jazeera International, NBC's "Politically Incorrect," and Fox's "The O'Reilly Factor." Her writings have appeared in The Huffington Post, Berkeley Law School's Journal for Middle East and Islamic Law, Counterpunch, Al-Majdal, and the Middle East Research and Information Project (MERIP).